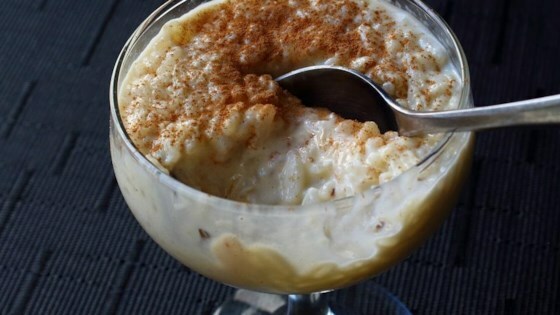 "For whatever reason, rice pudding is usually not near the top when people list their favorite desserts, but despite that, it's a proven crowd-pleaser, and quite easy to make, especially using this simplified, one-pot method." Place rice, salt, and water into a saucepan. Bring to a boil over medium-high heat. Reduce heat to low, cover, and cook until tender, about 20 minutes. Remove from heat; sprinkle with sugar and pour in milk. Stir with a whisk until until the thin layer of cooked-on starch at the bottom of the pan is cleared and incorporated into the mixture, 2 or 3 minutes. Place pan over medium heat, stirring frequently, until it reaches your desired of level of doneness and creaminess, 8 to 10 minutes. The longer it cooks, the thicker and stickier it will be. Remove from heat. Add vanilla and cinnamon. Very quickly whisk in the egg yolk (to prevent it from cooking). Whisk for about 1 more minute. Add butter and dried cherries; stir thoroughly. Transfer warm pudding to serving dishes. Cool to room temperature. Cover and refrigerate until thoroughly chilled, 3 to 4 hours. Total comfort in Chef John's one-pot rice pudding! If you're nervous about adding the egg yolk to the hot pudding, you can also place the yolk in a bowl, add a small amount of pudding to it, and whisk together. Transfer mixture to the pudding. Serving ideas: Simply dust top with cinnamon or fresh fruit. Or finish it like a crème brulee: Sprinkle about 1 tablespoon of sugar onto the pudding. Melt the sugar with a chef's torch until crisp and dark brown, 1 to 2 minutes. Allow to cool before serving. Made it exactly like the recipe and loved it. Delicious and simple. I used golden raisins and will try the cherries next time. There will definitely be a next time. Made this exactly as written and enjoyed it very much. Used jasmine rice, 1% milk and sugar. Perfect as is. Be careful of "doneness". Mine was a little too thick, but otherwise perfect. Family loved it.